Say Goodbye to Acne: 10 Daily Practices #infographic ~ Visualistan '+g+"
Millions of women and men around the world have to deal with both the physical and emotional impact of acne – in fact, according to some surveys, the psychological scarring takes its toll on the vast majority of afflicted persons, who suffer from lack of confidence, self-esteem, even depression. However, as all specialists will tell you, the best way to deal with it is to prevent it! 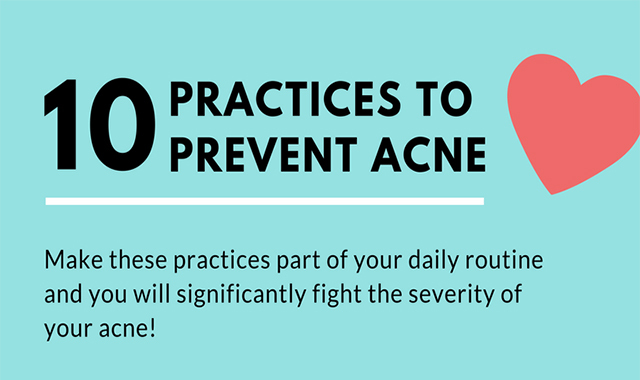 This infographic highlights 10 daily practices that will work wonders on your skin – incorporate them into your daily routine, and you’re sure to see the difference within a couple of weeks.